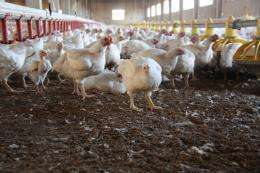 John Murawski, The News and Observer, Raleigh, N.C.
A Nevada energy developer says it has developed an environmentally clean way of using animal waste from chicken farms across the state to light up homes and offices. Green Energy Solutions wants to convert the bird droppings into methane and use the clean-burning gas as a renewable fuel to generate electricity. The new company is one of many that hope to benefit from a 2007 state law that requires electric utilities to increase their reliance on renewable fuels, such as solar energy, poultry waste and swine waste. But green remedies, like all answers to complex problems, cause side effects. Poultry waste, despite its abundance, has so far proven a problematic fuel. When burned directly, it spews air emissions comparable to those from a coal-burning power plant. Green Energy Solutions proposes to solve that problem by extracting methane from the waste and leaving behind an odorless sludge that can be used as fertilizer. In recent public filings with the N.C. Utilities Commission, the developer has said it is building a power plant in South Carolina that is set to begin operating in June 2010. According to filings, it is operating several similar facilities in Europe and has contracts or commitments with 13 poultry farms in North Carolina to supply organic fuel. Green Energy Solutions would generate electricity at the farm and sell the power to an electric utility. Company vice president Julian Cothran says Green Energy Solutions has submitted proposals to Progress Energy and Duke Energy, as well as to ElectriCities, which represents municipal power agencies, and to GreenCo, an arm of the state's rural electric cooperatives. "The challenge is getting a power purchase agreement signed to sell the electricity," Cothran said. "We're not polluting the atmosphere. We're not polluting the ground." Representatives from the power companies were not available for comment, but Cothran told the utilities commission in a recent filing that the utilities have been slow to embrace Green Energy Solutions. Progress Energy said the price was too high and signing a 25-year contract was too risky. GreenCo was not responsive, Cothran said in a filing. Cothran said the prices he's negotiating are confidential, but the talks are continuing. In the filing, Cothran cites among his qualifications two engineering degrees and 40-plus years' experience in engineering in the U.S. Army and private industry. He launched the company in Nevada in 2007 with colleagues. The only colleague named in the company's registration with the N.C. Department of the Secretary of State is A.T. Mathis, listed as Green Energy Solutions' president, treasurer and secretary. Mathis did not return a phone call or an e-mail message, and Cothran did not respond to further questions about his partner. Green Energy Solutions shares a street address with another Mathis venture, Boss Business Services, which specializes in asset protection planning, tax advice and other business services. Last month, Boss Business Services launched a new product, the Business Optimizer, which costs $495 and is guaranteed to help customers find $2,500 in tax overpayments, missed deductions and other oversights. Green Energy Solutions is not the first company to try to tap poultry waste as a renewable resource. Fibrowatt, based in Pennsylvania, operates a facility in Minnesota and has selected three sites in this state for development. Fibrowatt, which would burn the waste, hasn't signed contracts to sell power in this state, and was fined $65,000 this month for exceeding pollution limits in Minnesota. Methane is used to generate electricity in North Carolina and elsewhere in this country, primarily by tapping large concentrations of gas seeping from landfills. Burning methane is "carbon neutral," Cothran said. When burned, methane emits about half the carbon dioxide that is emitted by burning coal. Burning coal introduces new carbon dioxide into the atmosphere, whereas burning methane releases carbon dioxide that would have come out anyway when animal waste deteriorates naturally. "It's total waste-to-energy," he said. ..but it needs to get cheaper.. In another words, it just needs to get greener, because cost of technology reflects the consumption of matter and energy required for its introduction. Sounds like Green Energy Solutions is trying to get a premium for their electricity using the 2007 state mandate as leverage. That is 100% speculation though.